Last year I took over two dozen long haul flights, the majority of those taking place during an absolutely insane two months. For the first time in my life I finally understood the importance of in-flight skincare. I was previously arriving in cities looking like I had just come from the land of plague. My skin was dry, dusty almost, and absolutely grey. Not a good look at all when you are jumping off a plane to meet with fashion clients. Actually, not a good look in general when you are meeting anyone for any reason. In this day and age, there is no excuse for what I call "the long-haul lackluster." Technology has blessed us with tricks of the trade to keep our skin hydrated and ready for red carpet arrivals straight from the runway. 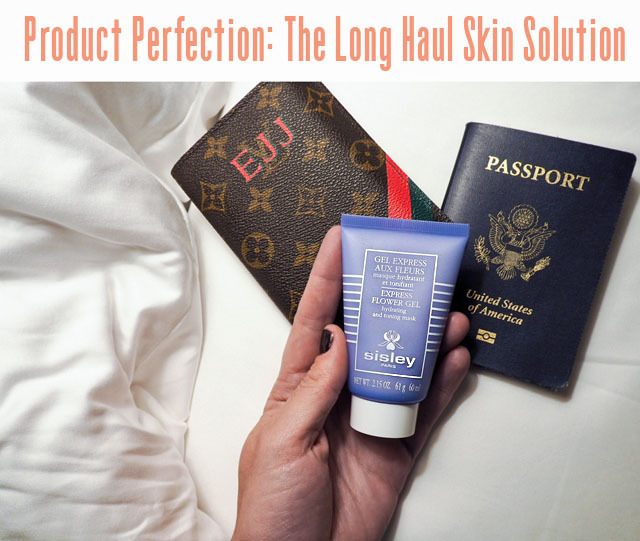 At the moment, everyone I know is swearing by the product that is transforming our skin in three minutes, both on and off long haul flights - Sisley's Express Flower Gel. So what's the score here? Well, let's start by saying what it does. Is it too much of a cliche to call it a miracle in a bottle? Perhaps. But, I'm going there. This is a gel that is more or less an express drink for your skin. You slather it on your face, wait three minutes and then wipe away whatever is left. Voila, your skin looks like it's just received the most refreshing drink of its life. Now, here's the interesting thing - I find this is a true reading of how hydrated my skin actually is. I have worn it at the start of a flight, where my skin is relatively normal and hydrated, so there was some gel to wipe away. Conversely, I have worn the Sisley Express Flower Gel mask upon returning from a trip to the desert (true story) and found that there wasn't a bit of remaining gel to speak of. My skin had soaked up every bit because it needed every bit. Now about purchasing... First, Sisley's Express Flower Gel is flight safe friendly in packaging - it falls under the mark for ounces. Hallelujah and first good sign! In fact, it's teeny enough to easily pack for any form of transportation. Second, although it's not on the cheaper side of beauty, it's worth every dollar of the $140 you will spend to have it in your arsenal of beauty solutions. I will never take a long-haul flight without this in my bag. I'm officially saying goodbye to the in-flight zombie mode and embracing the celeb way to keep it real (yes, this is absolutely adored by celebs and just about everyone in the know when it comes to travel... I was just a wee bit behind...sorry about that)! Purchase for $140 from Nordstrom or for £80 from Selfridges.